The trip to Acadia National Park in Maine was very flexible, as I did not have a fixed schedule of things to do or people to meet. With more time on my hands, I decided to take the backcountry route instead of the freeways. It took me an extra hour, but a drive through the countryside is always rewarding. You can stop by the food stalls in the farms and enjoy some fresh fruits and nuts. Now, in Maine, instead there were lobster “farms”, where the food stalls sold lobster rolls and fried seafood. Delicious! That’s why in Maine I decided to go on a strict lobster diet. Every Maine meal had to have some lobster in it. Over the next two days, I had a giant 3 lbs lobster with butter, a lobster omelet for breakfast, and several servings of lobster bisque and lobster rolls (mainly as snacks). I reached Bar Harbor, a little town near Acadia National Park around 4pm. The question now was whether to have an early dinner and then take pictures of the sunset at a pier or vice versa. I decided to go for the lobster dinner first. Next to the pier, there was a food shack, which looked more like a warehouse. The folks here catch and preserve the lobsters and fishes. They also have a little restaurant with some tables outside where you can enjoy your meal while looking at the yachts parked outside. The warehouse kind of a feel of this restaurant is a bit strange and confusing too. They have a huge room with tanks full of live lobsters. You get to scan the lobsters and pick the one you want. Then they take the lobster to the tiny kitchen inside and cook it for you. (Btw, the cashier there was une petite Quebecoise fille avec a sweet, French accent.) Ok back to the lobster. So, I had it with some corn and garlic butter. Apart from this lobster eating business, as I mentioned before, I had more time with me in Maine. This gave me ample opportunities to experiment with my camera and use my new tripod. During this entire trip along the east coast, I had been desperately trying to catch a glimpse of the sunrise and/or the sunset. Either it rained or I did not make it to the vista point on time. But in Maine, I made sure this did not happen. 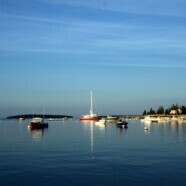 So, after the early dinner, I went to this quiet pier in Manset, Southwest Harbor and took some pictures of the sunset. In the last couple of weeks, I read a lot on the Internet about how to take pictures of the sunset/sunrise. The experts vary in their opinion. And I kind of understand why. There’s no thumb rule or recipe to follow. Just start with a slow shutter speed and don’t use a high ISO. Then play around with rest of the settings. You never know which combination might work on that particular day/moment. Anyway, check the album below. I think the shots of the silhouettes turned out to pretty decent. The Maine story is not over yet. The best part is yet to come. When I met my roomie Joe in Boston, he gave me some nice tips on Maine. He recommended that I check out the sunrise from Cadillac Mountain in the Acadia National Park. The cool thing about Cadillac is that it is firstly at a good height from which you get a magnificent view of the Atlantic Ocean. The cooler thing is that Cadillac, being one of the easternmost points in mainland US, gets to see the sunrise first. And the coolest thing is that, the first rays of the (very) early morning sun hit Cadillac at 4.30 a.m., which means I had to get up at 3.30 a.m. (aaargghh!!) to see the sunrise. But believe me, it was worth the pain. It was very windy at the summit, but the colors of the early morning sky made up for the cold weather. After the sun was up, I spent a couple of hours driving around the loop in Acadia. There are some nice trails along the cliffs in this national park. Overall, a great couple of days. This also meant that I “captured” the second corner in the Four Corners roadtrip. Now began the business end of the trip to the Seattle. Next stop is Niagara Falls via Vermont and upstate New York.